This article is about the 2006 film. For the concept of blood diamonds in general, see Blood diamond. For other uses, see Blood diamond (disambiguation). Blood Diamond is a 2006 German-American political war thriller film co-produced and directed by Edward Zwick, starring Leonardo DiCaprio, Jennifer Connelly and Djimon Hounsou. The title refers to blood diamonds, which are diamonds mined in war zones and sold to finance conflicts, and thereby profit warlords and diamond companies across the world. The film's ending, in which a conference is held concerning blood diamonds, refers to a historic meeting that took place in Kimberley, South Africa in 2000. It led to development of the Kimberley Process Certification Scheme, which sought to certify the origin of rough diamonds in order to curb the trade in conflict diamonds, but has since been mostly abandoned as ineffective. The film received mixed but generally favorable reviews, with praise directed mainly to the performances of DiCaprio and Hounsou; they were nominated for the Academy Award for Best Actor and Best Supporting Actor, respectively. It is 1999 and Sierra Leone is ravaged by major political unrest. Rebel factions such as the Revolutionary United Front frequently terrorize the countryside, intimidating Mende locals and enslaving many to harvest diamonds, which fund their increasingly successful war effort. One such unfortunate local is fisherman Solomon Vandy (Djimon Hounsou) from Shenge, who is separated from his family and assigned to a workforce overseen by Captain Poison (David Harewood), a ruthless warlord. One morning, Vandy discovers an enormous pink diamond in the riverbank. Captain Poison tries to take the stone, but the area is suddenly raided by government troops. Vandy buries the stone before being captured. Both Vandy and Poison are incarcerated in Freetown, along with Danny Archer (Leonardo DiCaprio), a white Rhodesian gunrunner jailed while trying to smuggle diamonds into Liberia. They were intended for Rudolph van de Kaap, a corrupt South African mining executive. Hearing of the pink diamond in prison, Archer arranges for himself and Vandy to be freed from detention. He travels to Cape Town to meet his employer: Colonel Coetzee (Arnold Vosloo), an Afrikaner formerly with the apartheid-era South African Defence Force, who now commands a private military company. Archer wants the diamond so he can sell it and leave the continent forever, but Coetzee wants it as compensation for Archer's botched smuggling mission. Archer returns to Sierra Leone, locates Vandy, and offers to help him find his family if he will help recover the diamond. Meanwhile, RUF insurgents escalate hostilities; Freetown falls to their advance while Vandy's son Dia (Kagiso Kuypers) is among those rounded up to serve as a child soldier under a liberated Captain Poison. Archer and Vandy narrowly escape to Lungi, where they plan to reach Kono with an American journalist, Maddy Bowen (Jennifer Connelly); in exchange, Archer will provide evidence on the illicit diamond trade. The trio arrive in Kono after a harrowing journey, where Coetzee and his private army — contracted by the Sierra Leone government — prepares to repulse the rebel offensive. While Maddy gets out with her story, the two men set out for Captain Poison's encampment. Dia, stationed with the RUF garrison there, is confronted by Vandy, but having been brainwashed he refuses to acknowledge his father. Archer radios the site's coordinates to Coetzee, who directs a combined air and ground assault on the camp; Vandy finds Captain Poison and beats him to death with a shovel as the mercenaries overwhelm the RUF defenders. Coetzee then forces Vandy to produce the diamond, but is killed by Archer, who realizes Coetzee would eventually kill them both. Dia holds the pair briefly at gunpoint, but Vandy confronts him again and renews their bond. Pursued by vengeful mercenaries, Archer discloses he has been mortally wounded and entrusts the stone to Vandy, telling him to take it for his family. Vandy and his son rendezvous with Archer's pilot, who flies them to safety while Archer makes a final phone call to Maddy; they share final farewells as he asks her to assist Vandy, and gives her permission to finish her article. Archer finally takes in the beautiful African landscape before (presumably) dying. Vandy arrives in London and meets with a van de Kaap representative; he exchanges the pink diamond for a large sum of money and being reunited with his entire family. Maddy takes photographs of the deal to publish in her article on the diamond trade, exposing van de Kaap's criminal actions. Vandy appears as a guest speaker at a conference on "blood diamonds" in Kimberley, and is met with a standing ovation. Ato Essandoh as Captain "Rambo"
Charles Leavitt was hired by Warner Bros. in February 2004 to rewrite an early draft of the film, then titled Okavango. The story had been stuck in "development hell" at the studio for years before producers Paula Weinstein and Gillian Gorfil finally decided on the story of an African farmer caught up in the conflict between an American smuggler and the local diamond mining organization. Leavitt researched the diamond industry to great lengths before he began writing the screenplay, explaining that he has "always been a stickler for immersing [himself] in research". He wrote the film with the assumption that it would offend the diamond industry, particularly De Beers, and so made sure to portray the industry truthfully, aware that he could potentially be sued by De Beers and other powerful mining corporations. Paula Weinstein was impressed by Leavitt's Blood Diamond draft, but hired writers Ed Zwick and Marshall Herskovitz to rewrite the script again; by the time he had completed the script, Zwick had become so interested in the story that he agreed to direct the film as well. Leonardo DiCaprio's performance in the film was particularly praised by most of the critics. Review aggregator Rotten Tomatoes reports that 62% of critics have given the film a positive review based on 211 reviews, with an average score of 6.3/10, making the film a "fresh" on the website's rating system. At Metacritic, which assigns a weighted mean rating out of 100 to reviews from mainstream critics, the film received an average score of 64, based on 39 reviews, which indicates "generally favorable reviews". Claudia Puig of the USA Today gave the film a positive review, stating that "Blood Diamond is a gem in a season with lots of worthy movies." Puig also praised DiCaprio's acting and noting that "it is also the first time the boyish actor has truly seemed like a man on film." Peter Rainer of the Christian Science Monitor also gave the film a positive review. He, like Puig, also praised DiCaprio's acting, stating: "As strong as Blood Diamond is in its best moments, I wish it had been even harder-edged. DiCaprio is remarkable - his work is almost on par with his performance this year in The Departed." William Arnold of the Seattle Post-Intelligencer gave the film a positive review, stating: "Zwick's narrative skills keep us hooked on the story, and the first-rate production values and imaginative use of locations (it was shot in Mozambique) give the film an enthralling scope and epic sweep." Damon Wise of the Empire magazine gave the film four-stars-out-of-five, he stated: "Great performances, provocative ideas and gripping action scenes fall prey to Hollywood logic and pat storytelling in the final hour." David Edelstein of the New York magazine also gave the film a positive review, stating: "Given that the movie doesn't have a single narrative surprise--you always know where it's going and why, commercially speaking, it's going there--it's amazing how good Blood Diamond is. I guess that's the surprise." Ann Hornaday of the Washington Post also praised DiCaprio's acting, saying that he "who between this outing and The Departed has undergone a major growth spurt this year." About the film itself, she stated: "For its flaws, Blood Diamond is a gem, if only for being an unusually smart, engaged popcorn flick." James Berardinelli of the ReelViews gave the film three-out-of-four-stars, stating: "It's a solid performance from Leonardo DiCaprio, who has grown into this sort of "gritty" role and is more believable after having been seen dancing on the dark side in The Departed." Dana Stevens of the Slate magazine is also among those who gave the film a positive review, she stated: "Blood Diamond is a by-the-numbers message picture, to be sure... But the director, Edward Zwick, is craftsman enough that the pace never slackens, the chase scenes thrill, and the battle scenes sicken. And if it makes viewers think twice about buying their sweethearts that hard-won hunk of ice for Christmas, so much the better." Ty Burr of the Boston Globe, after giving the film a positive review, stated: "As an entry in the advocacy-entertainment genre, in which glamorous movie stars bring our attention to the plight of the less fortunate, Blood Diamond is superior to 2003's ridiculous Beyond Borders while looking strident and obvious next to last year's The Constant Gardener. Pete Vonder Haar of the Film Threat gave the film a mixed review, stating: "It's a reasonably entertaining actioner, and Zwick doesn't shy away from depicting violence or the horrors of war, but as a social statement it falls a little short. And emeralds are prettier anyway." Marc Savlov of the Austin Chronicle also gave the film a mixed review, he stated: "While the film never quite reaches the emotional peaks it so obviously seeks to scale, Zwick's film is still potent enough to save you three months salary." Nathan Lee of the Village Voice, like Vonder Haar and Savlov, also gave the film a mixed review, stating that "De Beers can relax; the only indignation stirred up by Blood Diamond won't be among those who worry about where their jewelry came from, but with audiences incensed by facile politics and bad storytelling." Scott Tobias of the A.V. Club gave the film "C", he stated: "Much like Zwick's Glory and The Last Samurai, Blood Diamond strives to be an "important" film while stopping well short of being genuinely provocative and artistically chancy." Mick LaSalle of the San Francisco Chronicle gave the film a negative review, stating that "director Edward Zwick tried to make a great movie, but somewhere in the process he forgot to make a good one." Blood Diamond opened on December 8, 2006 in the United States and Canada in 1,910 theaters. The film ranked at #5 on its opening weekend, accumulating $8,648,324, with a per theater average of $4,527. The film's five-day gross was $10,383,962. The film dropped down to #7 on its second weekend, accumulating $6,517,471 in a 24.6% drop from its first weekend, and per theater average of $3,412. By its third weekend it dropped down even more to #12 and made $3,126,379, $1,628 per theater average. Blood Diamond went on to gross $57,377,916 in the United States and Canada and $114,029,263 overseas. In total, the film has grossed $171,407,179 worldwide. Blood Diamond: Original Motion Picture Soundtrack is the soundtrack to the film of the same name, released on December 19, 2006 by Varèse Sarabande. It was composed by James Newton Howard, and won the "Soundtrack of the Year" at the 2008 Classical BRIT Awards. Blood Diamond was released on DVD in region 1 format on March 20, 2007. Both a single-disc and a two-disc version are available. High Definition versions on HD DVD and Blu-ray have also been released with a R rating in the United States and a rating of MA in Australia. The film has sold an estimated 3.6 million DVD units and has grossed $62.7 million in sales. ↑ "Blood Diamond Details and Credits". Metacritic. Retrieved 2014-01-27. 1 2 3 4 "Blood Diamond (2007)". Box Office Mojo. IMDb. Retrieved September 7, 2012. ↑ "Blood Diamond". The-Numbers.com. Nash Information Services, LLC. Retrieved September 7, 2012. 1 2 Dunkley, Cathy (24 February 2004). "WB leaving 'Okavango' to Leavitt". Variety. Retrieved 2014-11-01. 1 2 Faye, Denis (2006). "Diamond Scribe". Writers Guild of America, west. Archived from the original on 2014-11-02. Retrieved 2014-11-01. ↑ Brodesser, Claude (28 June 2005). "WB polishes 'Diamond'". Variety. Retrieved 2014-11-01. ↑ "Blood Diamond". Rotten Tomatoes. Flixster. Retrieved January 1, 2011. ↑ "Blood Diamond". Metacritic. CBS Interactive. Retrieved November 26, 2010. ↑ Puig, Claudia (December 7, 2006). "Blood Diamond shines forth". USAToday.com. Gannett Co. Inc. Retrieved September 9, 2012. ↑ Rainer, Peter (December 8, 2006). "Star-studded, flawed diamond". CSMonitor.com. Christian Science Monitor. Retrieved September 9, 2012. ↑ Arnold, William (December 7, 2006). "Blood Diamond is a multicarat message movie". SeattlePI.com. Hearst Communications Inc. Retrieved September 9, 2012. ↑ Wise, Damon. "Blood Diamond". EmpireOnline.com. Bauer Consumer Media. Retrieved September 9, 2012. ↑ Edelstein, David (December 3, 2006). "They Cut Glass. And Hands.". NYMag.com. New York Media LLC. Retrieved September 9, 2012. ↑ Hornaday, Ann (December 8, 2006). "Blood Diamond". WashingtonPost.com. Retrieved September 9, 2012. ↑ Berardinelli, James (2007). "Review: Blood Diamond". ReelViews.net. Retrieved December 27, 2010. ↑ Stevens, Dana (December 8, 2006). "Trading Spaces". Slate.com. The Slate Group, LLC. Retrieved September 9, 2012. ↑ Burr, Ty (December 8, 2006). "'Diamond' trades on action and star appeal". Boston.com. Retrieved September 9, 2012. ↑ Vonder Haar, Pete (2006). "Blood Diamond". FilmThread.com. Hamster Stampede LLC. Retrieved September 9, 2012. ↑ Savlov, Marc (December 8, 2006). "Blood Diamond". AustinChronicle.com. Austin Chronicle Corp. Retrieved September 9, 2012. ↑ Lee, Nathan (November 28, 2006). "Say It with Diamonds?". Village Voice. Village Voice, LLC. Retrieved September 9, 2012. ↑ Tobias, Scott (December 7, 2006). "Blood Diamond". AVClub.com. Onion Inc. Retrieved September 9, 2012. ↑ LaSalle, Mick (December 8, 2006). "Romancing the enormous conflict diamond". SFGate.com. Hearst Communications Inc. Retrieved September 9, 2012. ↑ "Weekend Box Office Results for December 8–10". Box Office Mojo. IMDb. Retrieved September 7, 2012. ↑ "Daily Box Office Results for December 12". Box Office Mojo. IMDb. Retrieved September 7, 2012. ↑ "Weekend Box Office Results for December 15–17". Box Office Mojo. IMDb. Retrieved September 7, 2012. ↑ "Weekend Box Office Results for December 22–24". Box Office Mojo. IMDb. Retrieved September 7, 2012. ↑ "The 79th Academy Awards Nominees and Winners". Oscars.org. Retrieved November 20, 2011. 1 2 "Blood Diamond – DVD Sales". The-Numbers.com. Nash Information Services, LLC. Retrieved September 9, 2012. ↑ "Blood Diamond [DVD] ". Amazon.com. Retrieved September 9, 2012. 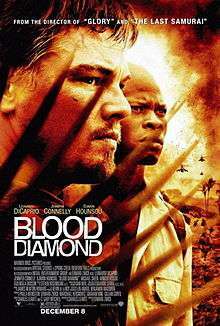 ↑ "Blood Diamond (Two-Disc Special Edition) (2007)". Amazon.com. Retrieved September 9, 2012.